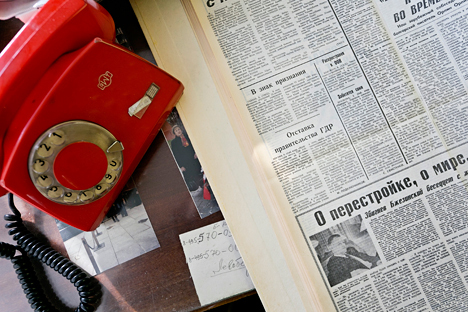 As the Berlin Wall came down, Soviet newspapers maintained a steadfast silence for a few days. However, attentive readers would have understood from the careful wording of several reports that dramatic changes were taking place. On Nov. 9, 1989, the world press reported that the wall that separated Berlin into western and eastern parts had been demolished. However, Soviet papers failed to report the news. At the time, Soviet people could learn about the fall of the Berlin Wall only from rumors or subtle hints that managed to ‘leak’ into the national press. A number of national papers did not reach the newsstands that day. The missing titles included Moskovsky Komsomolets, Sovetskaya Rossiya, Komsomolskaya Pravda, and Trud. Only two main national papers – Pravda and Izvestia – came out on the day the Berlin Wall came down. However, they too were conspicuous in their failure to mention the fall of the Berlin Wall, though they did report on the domestic political situation in the German Democratic Republic (GDR), or East Germany, as it was widely known in the West. A perceptive reader could conclude from that statement that GDR citizens had got an opportunity to leave the country, which meant that the borders were open, and by extension that the Berlin Wall was no more. Between Nov. 10 and Nov. 20, Pravda continued to cover political events in the GDR and FRG, but none of the articles mentioned the wall. At the same time, a dispatch by the above-mentioned Podklyuchnikov in the Nov. 12 issue of the paper reported that East Germans were moving to the west en masse and handing in their Socialist Unity Party of Germany membership cards. Finally, on Nov. 14, the Moskovsky Komsomolets newspaper joined in the coverage with a news-in-brief piece reporting that GDR border guard troops had been issued an order that “they should do everything necessary to assist the orderly and smooth implementation of the new rules regulating movement across the border between the GDR and the FRG and West Berlin”. In the meantime, November issues of Komsomolskaya Pravda, Trud, Sovetskaya Rossiya, and Moskovskiye Novosti had carried no reports about this. On Nov. 10, which was marked in the USSR as the professional holiday of the police force, the papers were full of glowing reports about Soviet police officers but did not say a word about the Berlin Wall. What happened to the dream of a Common European Home? One could venture a guess that the ban on reporting the events in Berlin came directly from the country’s leadership. For comment, we approached the Pravda newspaper, which still exists, though it ceased being the country’s main daily a long time ago. According to Pravda staffer, Nikolai Kozhanov, practically none of the journalists working for the paper in 1989 are on staff today. However, Kozhanov doubts that there was a “prohibitive” directive, let alone in writing. “Pravda journalists have always had a strong political sense. And, of course, when the news came of the fall of the Berlin Wall, they were in no hurry to print it. Those developments in effect signified the collapse of the socialist camp and reporting them would have meant recognizing the fact of the collapse. I think our journalists were hoping that things would sort themselves out somehow,” says Kozhanov. According to him, Pravda, the main newspaper of the USSR Communist Party, was very careful about covering events that could do damage to the reputation of the ruling regime. “For example, after Stalin’s death in 1953, there were large-scale workers’ strikes in the GDR. Things went so far that troops had to be brought in to break the protest up. Yet all that Pravda reported at the time was that there were minor protests by workers,” says Kozhanov. Nobody wanted to let Soviet people know that German workers had rebelled as it could have provoked similar unrest in the USSR.